Could Women be the Answer to the Driver Shortage? Randall-Reilly / Data / Could Women be the Answer to the Driver Shortage? Everyone is well aware of the current driver shortage the trucking industry is facing. The problem could be on the verge of getting even worse. The amount of freight shipped in the United States is growing by leaps and bounds. It is now estimated that the country will need 96,000 new drivers per year to keep pace with that growth. When most people think of truck drivers, they think of men. And for the most part they are correct. Men make up the overwhelming majority of truck drivers here in the United States. Women drivers consistently hover at around 4-7% of the driving force year after year. So, why is that? Females currently make up a sizable portion of the U.S. workforce. A total of 74.6 million are actively working. That number accounts for almost 47% of the total American workforce. With more drivers expected to be needed every year, recruiting has to change. What About Women Truck Drivers? Women recruits seem to be a huge resource waiting to be tapped into. Most fleets already know the potential is there, but have struggled with exactly how to target and recruit women. The best way to recruit new women is to hear what the current crop of women drivers have to say. What did they find attractive about driving? Why did they start? When you know the answers to these questions you will be in a much better position to recruit and secure new women drivers. Based on numbers from the She Drives Trucks Reader Profile, today’s women drivers are very happy with their choice of profession. This could be a major inroad to gaining new women drivers. Most people, including women, just don’t think of women as truck drivers. If you’re able to point out that not only do women drive trucks for a living, but are incredibly satisfied doing it, you may be able to change other women’s perceptions and successfully land new female drivers. According to the same study, women are very satisfied with their job as a truck driver. Just over 25% report that they are satisfied with the job, while over 50% love their occupation. That’s a huge number of satisfied workers no matter what profession you are talking about. In addition, almost 90% say that they would recommend their profession to other women. Truck driving in general is also a common and popular profession nation wide. When you combine these positive numbers with the built-in perks such as, freedom of the open road, traveling the country (and being paid for it), and relative job security (you can’t outsource truck driving), you have a pretty attractive package. Knowing what women drivers think about their job and being able to convey that to prospects could be a very effective tool at turning the tide and getting more women on the road. In addition to bringing new women into the driving force, fleets can pursue existing female drivers. RigDig data can be used to go after a specific group of targets, in this case women drivers. With recruiters armed with the knowledge base of what women drivers think, in addition to the standard targeting techniques already deployed, using custom targeting could be the final factor to start winning the battle to recruit women. It’s not going to be easy to keep up with the growing demand being put upon the trucking industry. As we continue to change how we in the general U.S. population consume products and order more and more from online or out of state sources, the need for truckers will only continue to grow. 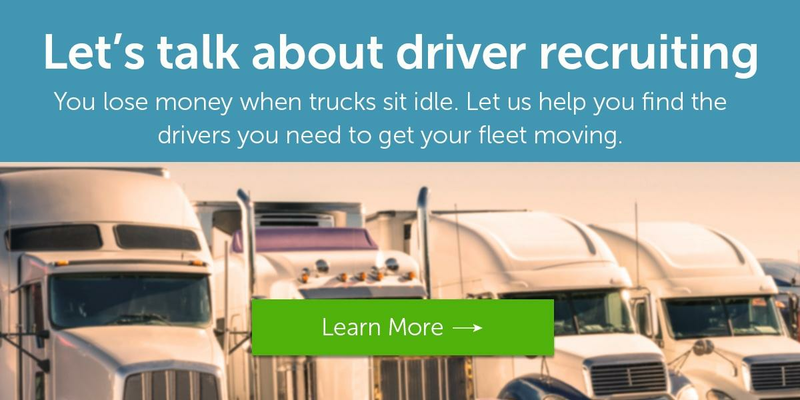 In order to fill that ever growing need, fleets may need to change who and how they recruit. Women make up half of the American workforce and have proven they are able to perform virtually any job. It’s time to bring that capable force to trucking as well.